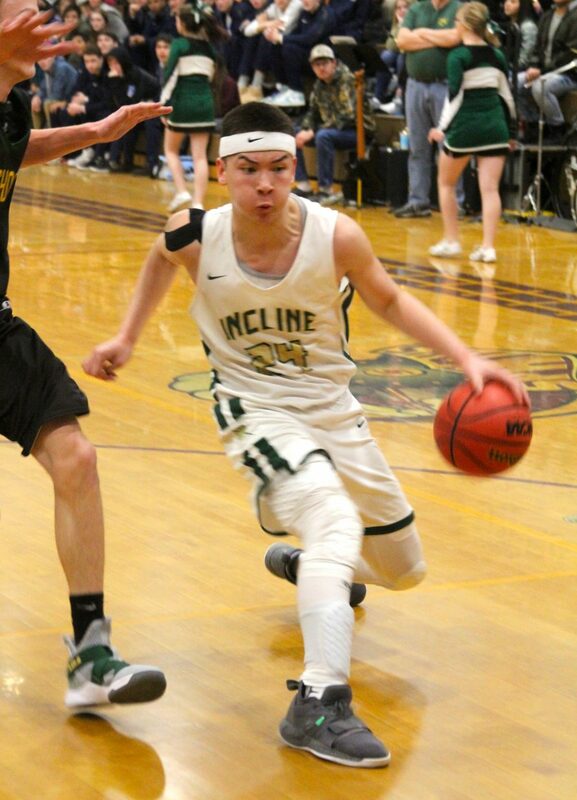 Incline's TT Valosek looks to penetrate the lane. SPARKS, Nev. — Incline head coach Tim Kelly called a timeout late in the fourth quarter and got in the faces of his Highlanders. He had just watched Battle Mountain outhustle his team for a loose ball and did not like what he saw. With the game in the balance, in front of a packed gymnasium, the No. 2 Highlanders responded with intense defense and pulled away in the final few minutes for a 57-49 victory over the No. 6 Longhorns in the semifinals of the Nevada Interscholastic Activities Association Class 2A Northern League Basketball Championships Friday at Sparks High School. With the victory comes a trip next week to Las Vegas for the state championships and a battle Saturday for the tournament championship. Incline freshman TT Valosek scored 21 points to lead all scorers. Seventeen of his points came in the second half, including 10 in the fourth quarter when he took over the game. Incline led 10-9 after the first quarter and the game was tied 24-24 at halftime. The Highlanders grabbed a three-point lead, 42-39, heading into the final eight minutes. But the Highlanders were down 39-35 before finishing the period on a 7-0 run. Senior Ian Smith hit a driving layup then made a steal on the next possession and was fouled. He hit one free throw but missed the second and Valosek was there for the putback. Smith, who scored 12 points, hit a 6-foot runner as time expired. Also scoring for Incline were Johnny Redfern (6), Liam Nolan-Bowers (4), Matthew Cornell (4), Cooper Lyons (3), Brad Rye (2) and Emerson Fleming (2), according to the official scorebook. The Highlanders (22-6) will play for the tournament title and No. 1 seed from the north at 1 p.m. Saturday at Sparks high School. They will play the winner between West Wendover and North Tahoe.